(Aarhus, Denmark) After three days and six races at the Sailing World Championships, the Laser fleets had a lay day to rest, recharge, and ready themselves for the final series. The 119 Laser Radials will be split into two fleets, gold and silver. The 165 Laser Standards are separating into gold, silver, and bronze fleets for the next two days of racing. 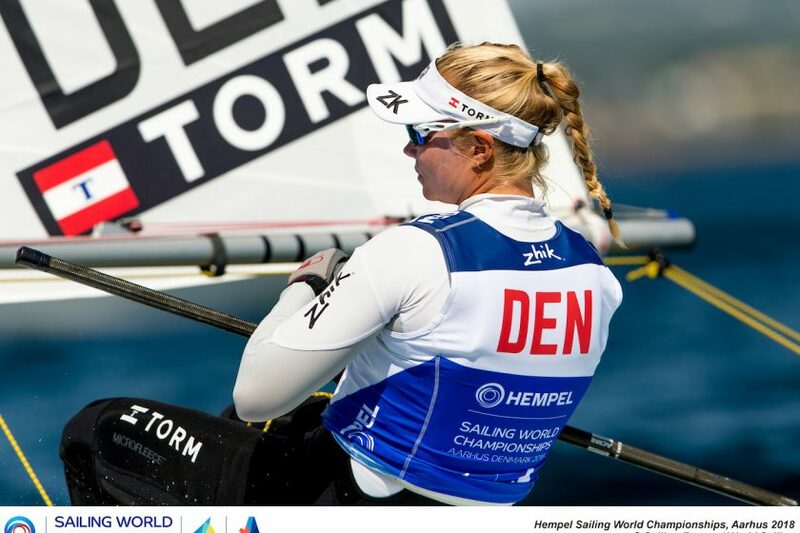 The Hempel Sailing World Championships is the first opportunity for sailors to qualify for Tokyo 2020. In the Laser Standard fleet, the top 14 countries will qualify, while the top 18 will qualify in the Laser Radial fleet. Based on past performance, it is no surprise that New Zealand and Australia are currently leading the event in the Laser Standards. They are both a shoo-in for qualification at this point, especially Australia with three sailors sitting in the top 4 on the leaderboard. Contrary to Australian representation at the event, Cyprus has one sailor competing for qualification in the Laser Standard. Pavlos Kontides maintained top-10 finishes in the qualifying series and is right up there with the Australians, currently tied with Tom Burton in the standings; he is also sure to achieve Olympic qualification from this event. Based on performance in the qualifying series, Great Britain and Germany have a strong hold on their positions as well, heading into the final races. A surprise, however, has come from performance of team USA in the Laser Standards. Olympian Charlie Buckingham has had a difficult last few races and is sitting in 33rd overall behind teammate Chris Barnard in 29th. They will have to fight their way up over the next two days in order to attain one of the last country-qualifying spots. The next two days will show very exciting racing as the stakes are raised. Be sure to tune in for LIVE coverage of the Gold fleet racing on Tuesday, August 7.